The <header> tag used as a container for introductory or navigational links. <header> tag usually contains heading elements or other elements such as Logo or icon, a search form, one or more heading elements (<h1>to<h6>). <header> tag supports Global Attributes and Event Attributes. <header> tag belongs to Flow content and palpable content. HTML4 does not support <header> tag. <header> tag used as a container for introductory contents. The output shows the multiple header information. 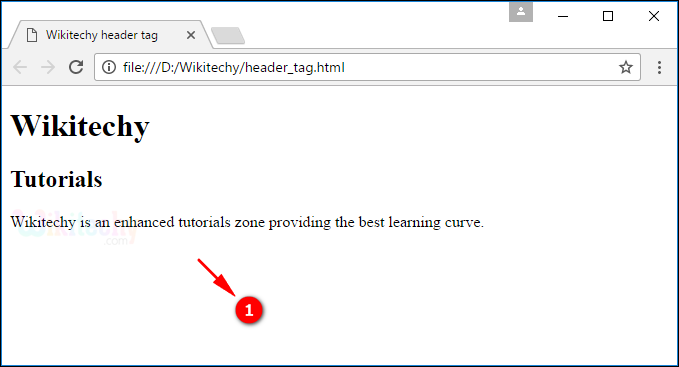 We cannot use the <header> tag within a <footer>, <address> or another <header> tag.